The ten classics explored in my article “Armchair Adventures” in the November/December 2007 (#30) issue of Fine Books & Collections are only the first chapter of a much bigger story. The following will keep you turning pages well past winter and provide comfort for those hot summer days. Other American dealer memoirs that can be counted as classics or nearly so: A. S. W. Rosenbach’s Books and Bidders (1927) and A Book Hunter’s Holiday (1936) are replete with stylized versions of his own book adventures. Many of these essays were first published in national magazines such as the Saturday Evening Post and played a key role in Rosenbach’s widespread fame. Charles Goodspeed’s Yankee Bookseller (1937) details the establishment and subsequent growth of the legendary Goodspeed’s Book Shop in Boston. David Magee’s Infinite Riches: The Adventures of a Rare Book Dealer (1973) describes Magee’s many years among the West Coast book trade. Leona Rostenberg & Madeleine Stern’s Old & Rare: Thirty Years in the Book Business (1974) is the first joint memoir by this highly respected bookselling duo. And don’t pass up H. P. Kraus’s A Rare Book Saga (1978) that recalls the dealings of this German émigré who assumed the Rosenbach mantle in some respects. 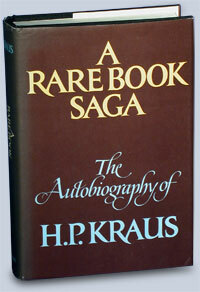 Kraus was based in New York City and dominated the high-end rare book market from the 1950s until his death in 1988. A fine supplemental biography to Stevens’s Recollections of James Lenox and Formation of His Library is Wyman Parker’s Henry Stevens of Vermont: An American Book Dealer in London, 1845–86 (1973). A companion to Randall’s Dukedom Large Enough is Dean Keller’s David Anton Randall, 1905–1975 (1992), which contains a selection of excerpts from Randall’s numerous book-related writings, and a bibliographical checklist of his works. Most accounts by and about collectors are found in periodical articles, pamphlets, and introductions to auction or private library catalogs. However, other full-length collecting memoirs are worthy of perusal. A few recommend choices: Barton Currie’s Fishers of Books (1931) best captures the spirit of 1920s collecting inspired by A. Edward Newton. Henry Wagner’s Bullion to Books (1941) has information about his collecting of Western Americana, a previously underappreciated area that Wagner himself promoted through his various bibliographic works. Vincent Starrett’s Born in a Bookshop (1965) provides a excellent view of the rare book and publishing world of Chicago during the first half of the twentieth century. Lessing Rosenwald’s Recollections of a Collector (1976), recounts the building of his outstanding library of early illustrated books and prints that he gave to the Library of Congress and the National Print Gallery. Jeff Dykes’s I Had All the Fun (1978) tells the book adventures of a highly knowledgeable collector and bibliographer (later a dealer) pursuing Western Americana on a modest budget. 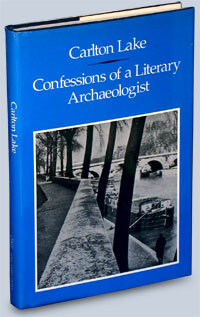 Also, Carlton Lake’s Confessions of a Literary Archaeologist (1990) provides a unique window into the collecting of French books and manuscripts by a prominent American collector. Additional rare book librarian memoirs and biographies that stand out are William L. Williamson’s William Frederick Poole and the Modern Library Movement (1963) which provides a look at librarianship and collecting in nineteenth century America, Edward G. Holley’s Charles Evans: American Bibliographer (1963) and Donald C. Gallup’s Pigeons on the Granite: Memoirs of a Yale Librarian (1988). Lawrence Clark Powell’s many writings, both essays and bibliographic works, are well worth exploring. A good place to start is the sequel to Fortune & Friendship entitled Life Goes on: Twenty More Years of Fortune and Friendship (1986), and Books Are Basic: The Essential Lawrence Clark Powell (1985). Auction house accounts to supplement Bruccoli’s The Fortunes of Mitchell Kennerley, Bookman are scarce so don’t miss Wesley Towner’s The Elegant Auctioneers (1970), another important book on American auctions that covers a wider scope. Two classics to keep by your side while you read the other books are Donald C. Dickinson’s Dictionary of American Book Collectors (1986), and Dictionary of American Antiquarian Bookdealers (1998). The word dictionary is a bit deceptive because both books provide not only names, dates, and brief information, but also mini-essays on each collector and dealer culled from multiple sources that are cited for further reading. The first volume covers “359 significant American book collectors who died before December 31, 1984.” The companion volume highlights “a select group of 205 notable American antiquarian bookdealers who died before 1 August, 1997.” Dickinson must be commended for the labor of love required to assemble these essential references. Dickinson, a retired professor of Library Science at the University of Arizona, Tucson, has also written among other works Henry E. Huntington’s Library of Libraries (1995) and John Carter: Taste and Technique of a Bookman (2004). Other references to keep close at hand are Carl Cannon’s American Book Collectors (1941), a biographical survey of collectors still unsurpassed in many ways, and the Grolier Club’s two collections of biographical essays on members, The Grolier 75 (1959) and Grolier 2000 (2000). Finally, there is a host of information available online. One should note in particular that Gale’s Contemporary Authors Online (drawn from the Dictionary of Literary Biography series) includes the biographical sketches and checklists of works of numerous book collectors, dealers, librarians, and bibliographers.